But First Let Me Take A Selfie – Share Your Selfies With Us On Instagram For A Chance To Win Prizes! 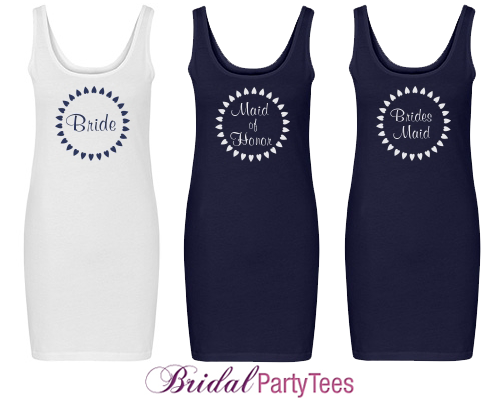 Have you recently placed an order with Bridal Party Tees? If so, you might have seen a new postcard included with your package. That postcard includes most of the same contest details as this blog post. See below for more info! Now that you have your new custom apparel in hand, put it on and take a selfie. Follow our Instagram account @BridalPartyTees. 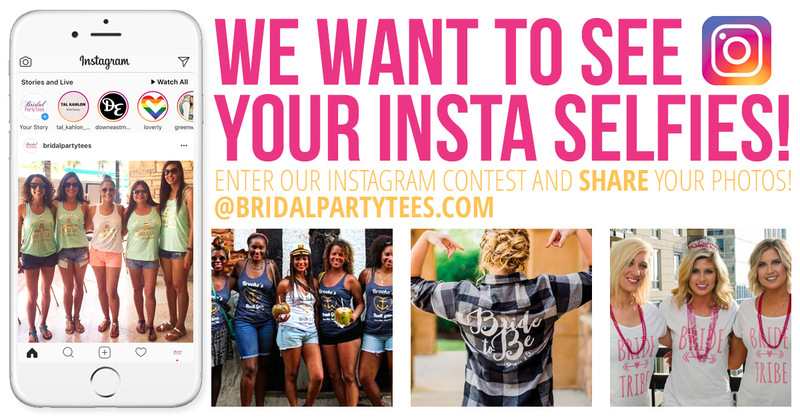 Tag your Instagram photo with @BridalPartyTees and #BridalPartyTees– If you don’t tag us we won’t able to see your lovely selfie. We’ll notify the winner by email at the end of December 2017, so be on the lookout! 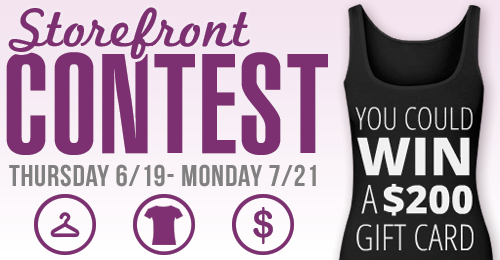 One lucky winner will win $250 for more custom apparel goodies! eRetailing Associates, LLC employees and their immediate families are not eligible to win. We will not be able to award entrants whose Instagram accounts are set to private. By submitting a photo, entrant grants Bridal Party Tees the right to publish submitted photo, name, city and captions on our website, social media or any other marketing materials. Slight photo alterations may be made by our staff in order to fit properly on our website or marketing materials. Photos deemed to be inappropriate or offensive by Bridal Party Tees will not be eligible. If a professional photo is submitted to our contest, Bridal Party Tees will not be held responsible for securing usage rights from the photographer. It is highly recommended that the entrant receive rights to use the photo prior to contest submission. By participating in the contest, you release and agree to hold eRetailing Associates, LLC, their respective subsidiaries and affiliates, and their respective directors, officers, and employees harmless from any and all losses, damages, rights, claims, and actions of any kind arising out of or in connection with your participation in the contest or your creation and sharing of pin boards, or resulting from acceptance, possession, use or misuse of any prize, including, without limitation, personal injuries, death, and property damage, and claims based on publicity rights, defamation, or invasion of privacy, whether suffered by you or a third party. The contest is void wherever prohibited or restricted by law, and is subject to all applicable federal, state and local laws and regulations. For international shipping, please be aware, you are responsible for any taxes or duties that might be applied to your package after it has left our facility. This promotion is in no way sponsored, endorsed or administered by, or associated with Instagram. By entering in this promotion you agree to a complete release of Instagram from any claims. For years now, Bridal Party Tees has been one of the few custom apparel websites to offer a true customization experience with rhinestones. Alas, all good things must come to an end. Starting today, we are phasing out rhinestones as an option within our Add Text and Add Art tabs of the design center. Soon, it will no longer be possible to place orders with rhinestones. This is an important update for all of our store owners and any of our customers with saved rhinestone designs in their accounts. First, we’d like to say that we are going to keep making amazing bachelorette party shirts for a very long time. We’re growing every year. Things are good. But trends in custom apparel decoration tend to come and go. To serve our customers and our store owners in the best possible manner, we have to keep up with these trends. Custom rhinestones have been on the downward trend lately. You know what’s on the upward trend? Custom metallic foil decoration. We’re adding silver, gold, and other metallic foil options to more and more items. People love it! Back to rhinestones. This phase-out process is happening in several steps. 1. We’re removing all rhinestone-related content from our website. 2. Then we will archive our Rhinestone Font options. When this happens, you will no longer be able to choose a Rhinestone font when you use the “Create” menu and start with a blank item. If you find a design that uses Rhinestone text, you will still be able to customize and purchase it (until we get to step 4). 3. Then we pause all Rhinestone Art options. 4. We will starting deleting all designs that use Rhinestones. Soon, we will no longer have the capability to produce Rhinestone related designs in our facility, and the only way to completely stop Rhinestones from being ordered is to delete the saved Rhinestone designs. A. Log into your account and click on your rhinestone design. C. If it uses Rhinestone Text, click the Text Style menu and choose a different font. If it uses Rhinestone Art, click the Add Art tab and choose a different piece of art. D. Click Save and you are good to go. We recommend doing this in the next couple of weeks. If you still like some bling on your custom shirts, we would like to recommend our Misses Relaxed Fit District Made Scoopneck Bling Tee. It has studs on the shoulders. You can add your own custom design to it, and we will print it in ink. The day is finally here! 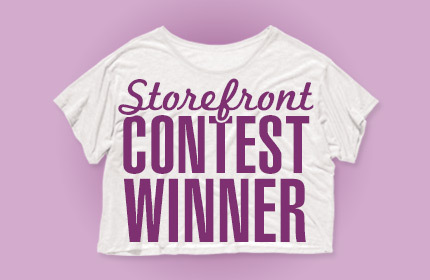 We’ve drawn the winner of our storefront contest! Congratulations to our winner! We’ve emailed you so please be sure to check for your gift card! Since we only received one entry, there will be no runner-up winners. Remember to keep designing new apparel for your storefronts and sharing on them Facebook, Twitter, Instagram and wherever else to gain those earnings! 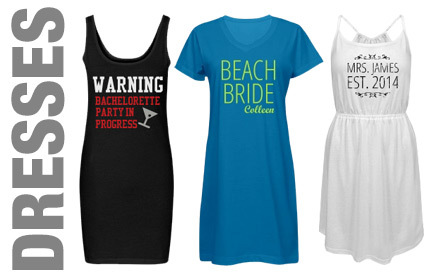 Customize a Dress for Your Summer Bachelorette Party! Just over a month ago we debuted a dress to our line of customizable items. All of our brides and their bridal parties loved the Jersey Tank Dress! And that makes us all the more excited to unveil a NEW dress! The Junior Fit District Strappy Dress features adjustable spaghetti straps, a cinched waist, and a flowy, pleated skirt. It is available in white, black, aquamarine, and heathered nickel. This breezy, lightweight, custom dress is ideal for the summer bachelorette parties on the beach or by a pool. Be the bride everyone loves and customize dresses for your entire bridal party! Enter To Win A Bridal Party Tees $200 Gift Card By Opening A Storefront! We are pleased to announce the Bridal Party Tees Storefront Contest! This contest will begin Thursday, June 19th 2014 and end on Monday, July 21st 2014 at 11:59PM EST. Winners will be chosen and announced on Tuesday, July 22nd. Step 1 – Create a storefront. 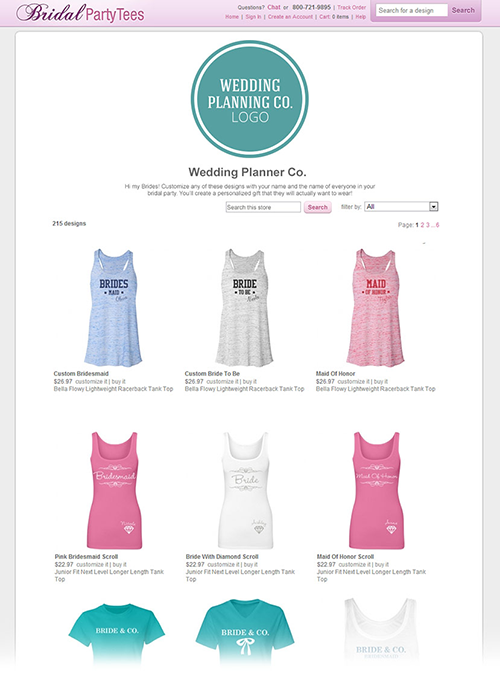 In order to start creating your storefront, you need to create a Bridal Party Tees account. For those of you who already have an account, you’re one step closer to designing! Once you have your account set up, you will be able to build and manage everything here in order to run your storefront. After creating and naming your storefront, the fun begins! Now it’s time to add five of your original designs. Just as a side note: you’ll want to make sure these are your own original and unique designs and not a design copied from somewhere else. Try to avoid any designs that could infringe on the copyrights of another brand or celebrity, make it truly yours! After saving your designs, they need to be approved before they will appear in your storefront. We love seeing awesome storefronts so send us an email with a link to your storefront and it’s that easy! You’ll be entered into the contest for a chance to win! One grand prize winner will receive a $200 gift card to Bridal Party Tees. Two runner-up winners will each receive a $50 gift card to Bridal Party Tees. Winners will be announced on Tuesday, July 22nd 2014. All winners will be notified by email. We will also announce the winning storefronts on our blog and social networks so stay tuned! What if I already have a storefront filled with five designs or more, can I still enter? You sure can! Just email us the link to your storefront at storefronts@bridalpartytees.com and you will be entered in the contest. By emailing you my storefront, am I signing up for any email newsletters? No. We will only use your email address to notify you if you are a winner of the contest. We do however encourage you to sign up for our email newsletters! These emails can include special deals and first notification of any new products and designs we have added! If you are interested in receiving our email newsletter, you can sign up at the bottom of the Bridal Party Tees website. Do I need to purchase anything to enter? No. You can be a lifelong customer of Bridal Party Tees or someone just discovering us for the first time! 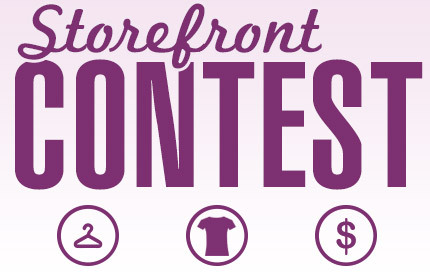 This contest is all about creating a storefront and adding designs. What if I’m not the best designer? Are the winners chosen by their design ability? No, all winners will be chosen at random. But as soon as you begin, you’ll notice how easy the Bridal Party Tees design center makes it for anyone, no matter his or her skill level. We have tons of art and text styles available for you to use and create great looking designs! How will you be picking the winner? The winners will be chosen randomly. Once we have confirmed your storefront meets the requirements you will be entered for a chance to win! We’ll announce the winners on our blog and notify the winners by email. Does the popularity of my storefront matter? Nope. You could have sold over a thousand designs or none at all, everyone’s eligible. I have created a storefront and entered the contest, now what? Enjoy what you have built and promote your work! Share your storefront on Twitter, Facebook and other social networks in order to show off your designs to friends and family. After all, you earn a royalty every time your design sells. What if I have other questions about the contest before I enter? 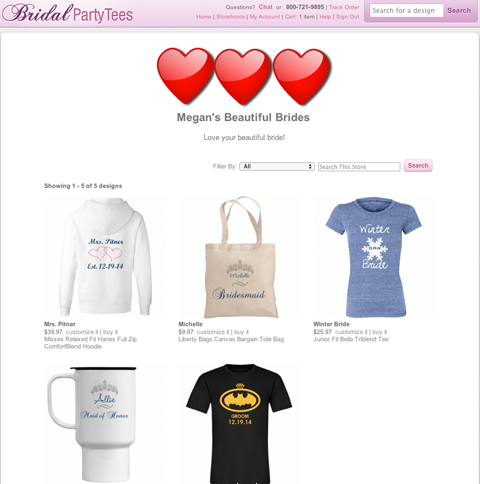 Email us anytime at storefronts@bridalpartytees.com. By participating in the contest, you release and agree to hold eRetailing Associates, LLC, their respective subsidiaries and affiliates, and their respective directors, officers, and employees harmless from any and all losses, damages, rights, claims, and actions of any kind arising out of or in connection with your participation in the contest or your creation and sharing of storefronts, or resulting from acceptance, possession, use or misuse of any prize, including, without limitation, personal injuries, death, and property damage, and claims based on publicity rights, defamation, or invasion of privacy, whether suffered by you or a third party. The contest is void wherever prohibited or restricted by law, and is subject to all applicable federal, state and local laws and regulations. Are you a wedding planner, photographer, or a bride-to-be looking for extra money for her wedding? We are very happy to announce the launch of the new Bridal Party Tees storefront program! We’ve created Bridal Party Tees storefronts to allow wedding industry professionals, graphic designers, photographers, and anyone with a desire to design our top-of-the-line apparel and accessories and earn a royalty for every sale! A storefront is a totally, completely, no-fees-ever free site hosted by Bridal Party Tees from which you can sell uniquely designed tees, tanks, crop tops, dresses, sweats, sashes, and so much more! This means you can use the art and fonts from our design center to create distinctive designs or upload your own photos, art, or logos to create something from scratch. For every sale that comes out of your storefront, you will earn a royalty! 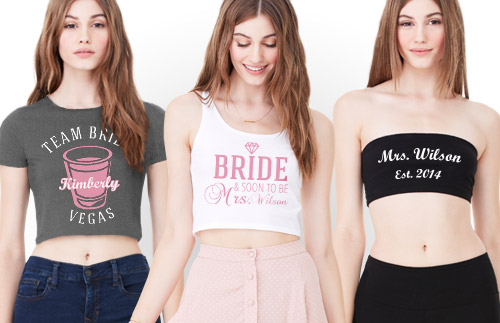 How do I open a Bridal Party Tees storefront? Sign into your account or create an account. On the My Account page, you will see a link to Create a Storefront. Click that link. Next you will be able to create a store URL, title, and description. You can also upload your own logo. The next time you save a design, you will see an option to share that design on your storefront. That’s it! What advantages does Bridal Party Tees offer? Well, we are the only wedding-specific, print-on-demand, apparel-storefront-system that exists. So that’s one advantage! We also have one of the biggest and trendiest selection of customizable women’s tops on the internet. Period. Plus tons of great accessories like scarves, socks, hats, and more. Plus all kinds of amazing apparel. Also, every design is customizable in our easy-to-use design center. For example: say you are a wedding planner and you want to encourage your bride to get custom, matching tank tops for her and all her bridesmaids- something to wear for photographs as they get ready for the wedding! You can create a storefront with your own custom bride and bridesmaid designs. Give the link to your bride, and she can add her name and her bridesmaids’ names to each design! What kind of royalties can I earn? Our storefront royalty rates are based on specific items. Selling the same design on one shirt may earn your a higher royalty than another shirt. Right now, it ranges from 10% to 16%. You will see the royalty rate on the product details page of every item and on the save page. When you save a design, you will see “The royalty rate for this item is __%”. How do I get paid from my Bridal Party Tees storefront? We use PayPal™. If you don’t already have a PayPal account, please create one. It’s easy and free. You will be asked to enter an email address. When you have earnings to redeem, simply go to My Account > Earnings and enter that same email address and click ‘redeem’. The royalty rate that you earn depends on the item sold. What will my storefront look like? We’re trying to keep things simple. You have a big profile image (like, for your logo). Then you have a store title and a description. Then you have all your designs. Simple as that! Check out The Bride’s Style storefront! 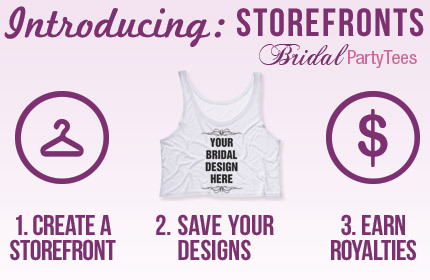 Or feel free to email us at storefronts@bridalpartytees.com! Custom Dresses for Bachelorette Parties and Honeymoons! 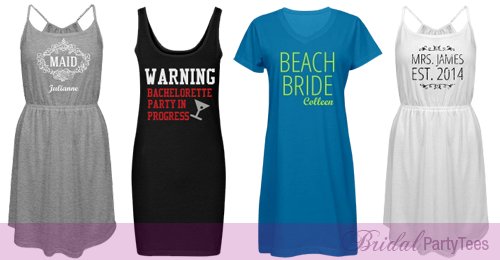 Bridal Party Tees has added a new, custom DRESS for your bridal and bachelorette parties! 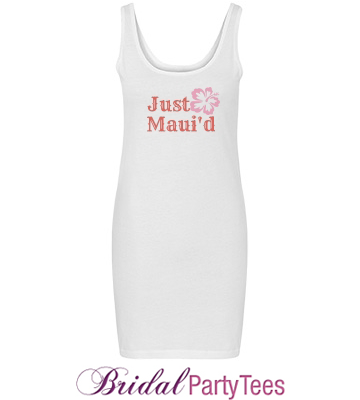 We have added a Junior Fit Jersey Tank Dress that you can customize for your bridal party, bachelorette party, honeymoon and more! The dress is available in white, black, navy, and heather grey. It’s made a of a lightweight, t-shirt material so it’s perfect for all the upcoming Spring and Summer weddings! We want to note that the dress may run a little for short some tastes. Please be sure to check the measurements of the custom dress to be sure of the sizing. Do you have a bachelorette party or honeymoon coming up? Customize a dress for the occasion today! Design a custom dress for your bachelorette party! Customize a dress for your honeymoon. Or design custom dresses for your entire bridal party! Planning a cruise for your upcoming bachelorette party? Heading to the coast for some fun in the sun with your girls? Maybe you’re entire wedding is beach themed. If you’re planning a marital, maritime bash then we have the perfect custom nautical theme shirts for you! Customize a nautical design for your bridal party to get ready in the morning of the big day. Customize a fun crop top for your beachy bachelorette party. Design a custom Navy Wife sweater if you’re marrying a military man. Or create a customized honeymoon tee for a cozy get-a-way! Don’t wait for the ship to come in! 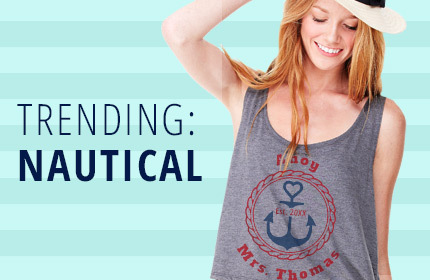 Customize your Nautical Theme Bridal Party Tee today! Grab your cell phone, your tablet, your color samples, your 500 bridal mags, your seating chart drafts, your save-the-date drafts, and your list of photographer and caterer prices. Don’t forget your wallet and car keys! It seems impossible at times to plan a wedding, but before you go turning into a bridezilla, take a breath and tackle the problem in your hands. There are a million things a bride-to-be needs to have on hand at any given moment. 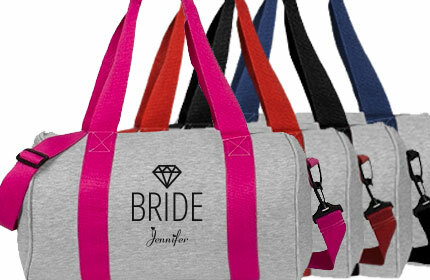 Tote all your wedding planning necessities in a new custom bag! We’ve added two brand new bags to expand our line of handy wedding planning accessories. 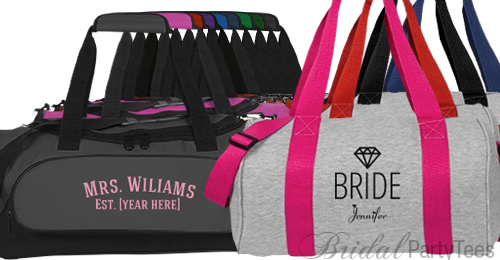 The Medium Duffel Bag and the Pro-Weave Bag are available for customizing! The Pro-Weave bag is the first duffel bag that we can decorate using our direct to garment digital printers. This means you can add full color art, lots of different text styles, and in general, more intricate designs than on our other duffel bags. We can print directly on this bag because it is made of fleece, just like most of our customized sweatshirts and hoodies.